Maybe it's because I'm picky or because I'm petite, but most Ace & Jig tops are too long, too big, or have too high of a neckline. So I'm pleased to say that the Ace & Jig Inez Top this season is none of the above — It's a total winner! Read on for a detailed review and more try-on photos. Ace & Jig's Description: a reversible elbow length sleeve top with a v-neck and bust darts. Size/Fit: True to size to a bit on the fitted side. If in doubt or in between sizes, consider sizing up. Length: Below hip length on me, so likely normal length for most. I like the length on myself, though it could certainly be a bit shorter. Closures: None. Slips on over head. This top is reversible in both of the fabrics shown, so you get a 2-in-1! This top has bust darts, which make for a slightly more fitted look that elevated this shape above your average v-neck shirt. The darts give this top a subtle a-line shape that I find both easy and flattering. Overall Thoughts: This top is so simple that it's easy to overlook among the flashier (read: ruffled, puff sleeved) pieces this season but that's part of why it's so great. I wouldn't call myself a minimalist or less-is-more kind of person, but I always gravitate towards the simpler cuts that Ace & Jig offers, because they allow the textiles to really shine, and also tend to work the best on my body. I guess what I'm saying is that I'm a fan of well-executed classics, and this is one of them. Though it's certainly beautiful in Cabaret/Antoinette, which was on my initial wishlist, I actually love it even more in Feather! I had mixed feelings about Damask from Spring 2017, which I had attributed to the textile, but it must have been the magenta that didn't agree with me. The soft neutral tones of Feather feel much more me, and this textile just feels so right in this shape. It's like the Ace & Jig version of the perfect white tee. 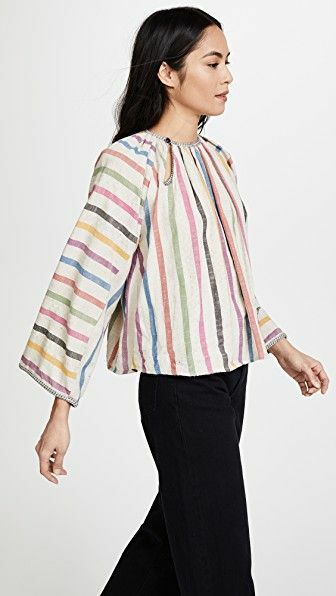 Have you tried the Inez Top in any textiles? What do you think? Don't forget to take a look at my other reviews of Ace & Jig pieces and textiles, and subscribe to emails for a daily digest of blog posts (no spam, ever)! Agree! Super flattering shape. I got Cabaret/Antoinette, but I am curious to see what the top would be like in the heavier-weight Feather. I'm hoping they make this one in some more textiles!